If you are looking at a fun overnight break from Darwin or stopping in Katherine for a short break we welcome you to enjoy Tom Curtain’s Katherine Outback Experience. Featuring two-time Australian Country Music Golden Guitar winner and horseman extraordinaire, Tom Curtain, our 1.5 and 2.5 hour shows provide guests a taste of the inner workings of an outback Australian cattle station with real horse-starting and working dog demonstrations, entwined with live acoustic music and humorous bush tales. The show runs during the dry season from April to October. The audience will be captivated as Tom works with a young wild horse and sometimes attempts to ride it for the first time (not always successfully). 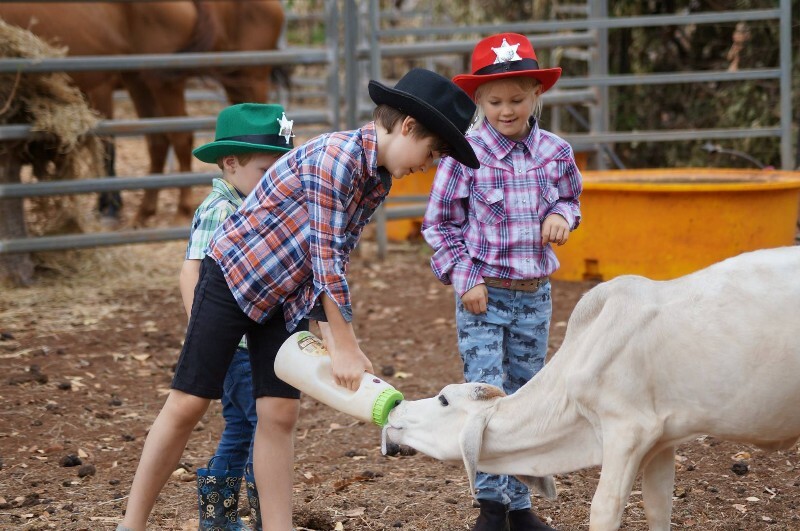 Here at Katherine Outback Experience we cater for school excursions, study tours and camps that can be tailored to meet all needs. Our teaching elements are aligned with learning outcomes of the Australian National Curriculum and delivered in a fun and interactive fashion. Are you thinking this all sounds great but perhaps the whole school might want to see the show? Or you’re not quite sure how you can fit it all into your busy schedule during your visit to the Northern Territory? That’s okay because we can come to you! We have the flexibility to load the crew into the truck and bring a variation of the show to you.